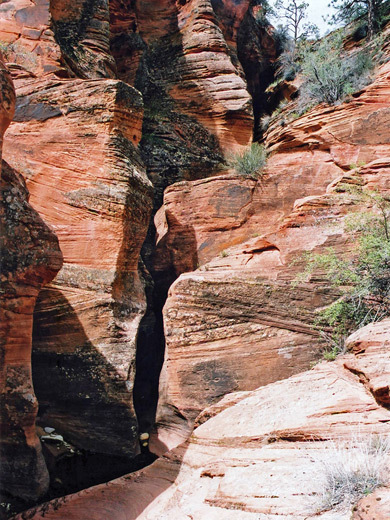 Also known as Fat Man's Misery, Misery Canyon is a relatively short slot canyon that runs from the south side of the White Cliffs near the southeast entrance to Zion National Park into Parunuweap Canyon, the deep gorge formed by the East Fork of the Virgin River. As its long name suggests, Misery is very narrow in places though not continuously so - the upper reaches have short, deep, enclosed passages of curvy narrows with watery potholes that in some places require rappelling to descend, separated by longer open parts. All these narrows can easily be bypassed if desired, apart from the last stretch near the river junction, which is much deeper and protected by a 30 foot dryfall, but even this can be partially explored without ropes if entering from the lower end at river level. Overall, Misery Canyon provides an excellent hike, moderately strenuous, in a beautiful and peaceful location. The canyon is reached by following the first part of the trail/route to Parunuweap Canyon, starting from a lay-by on the north side of UT 9, 1/4 mile west of Checkerboard Mesa. After 1 to 1.5 hours hiking, instead of following the white slickrock ridge due south, Misery is reached by walking diagonally down the far side, southeastwards, to the upper end of the left fork of the canyon, which starts as a sandy wash beneath an impressive series of swirling potholes. This is the branch usually explored though the longer right (east) fork also has narrows and could presumably be reached by climbing up and over the plateau between the two branches. 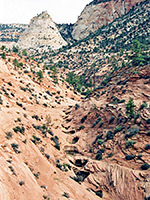 All the canyon lies on BLM land hence no permit is required, though access via the Checkerboard Mesa entry route requires paying the $25 fee to enter Zion National Park. 12 views of Misery Canyon. TopoQuest topographic map of Misery Canyon; the west fork of the drainage is just east of summit 5534. Below the potholes the canyon is wide and shallow, but not for long as the first narrows start soon, as the streambed becomes enclosed by sheer cliffs and drops abruptly about 5 meters into a narrow crack with a pool below - the first of 4 or 5 places that need rappelling. This drop is easily bypassed by backtracking a way and climbing round to the left, then once at stream level again, there are no major obstructions walking back upstream to beneath the dryfall. This section is typical of the slot-like parts of Misery Canyon, with curvy red walls, often stained blackish, pools, mud and potholes, rather dark and gloomy and not too good for photography. 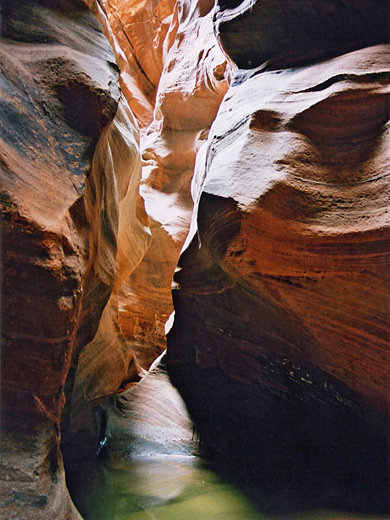 After a light, open stretch, the canyon enters a short shallow channel then, under a log wedged high above, drops into more dimly-lit passageways, deeper and narrower than before, twisting sharply round S-bends and through frequent pools up to 3 feet deep. This can be followed easily enough for a while, as far as a bigger drop into a deeper pool. An eye bolt on the right provides a rappel point. Again this whole section can be bypassed on the left, and partially explored from the lower end, though not quite as far as the big drop. 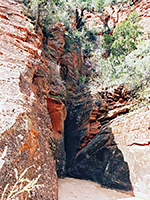 The next open region includes a shallowish channel containing a small natural arch. 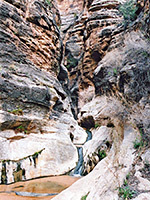 A short distance afterwards is the third slot section, the shortest, that also soon has a drop of several feet into a pool underneath a protruding log; beyond this, the canyon is no longer very enclosed and descends quite steeply towards the junction with the larger east fork, over a dryfall at the end which is passable by climbing down a slope a little way to the east. Upstream, the east fork soon enters a very dark, deep channel ending at a fall, with more good narrows above. Back downstream, progress is soon blocked by a big drop of 35 feet into the lower narrows, the best part of the canyon, and which extend all the way to the East Fork of the Virgin River. There are lots of jagged, fallen boulders beneath the falls, and several old webbing rings wrapped around a chokestone on the left. 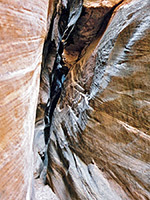 As there are no climb down routes here, unless rappelling, to enter the narrows requires a diversion of 40 minutes or so - traversing up and along the steep west face of the canyon to the top of a ridge just above the main river, following the lower end of the path used to reach Parunuweap Canyon, then walking up river about a third of a mile. A stream flows along the lower part of Misery Canyon, forming pools (containing frogs) and small waterfalls, past smooth white striated rocks decorated by patches of bright green vegetation, while above tower eroded cliffs several hundred feet high. Beyond the pools and past a climb of 5 feet, the canyon closes in and has narrow, curving chambers linked by sharp eroded fins and a few water-carved arches. It becomes quite dark, has deeper pools and potholes, one of which is difficult to pass though with a little effort all of this section can be followed. This is a cool and atmospheric place and all of the canyon, although generally rather dark, is still very pretty.